It just doesn't seem right to see the word "fail" in the same sentence as Sid and Marty Krofft--the sibling duo known for their string of highly successful children's fantasy TV programs and specials throughout the 70s and 80s. Yet in May 1976, the Krofft brothers ventured into unfamiliar territory when they opened up their own themed amusement park, called The World of Sid and Marty Kroftt, at the Omni Center in Atlanta, Georgia. 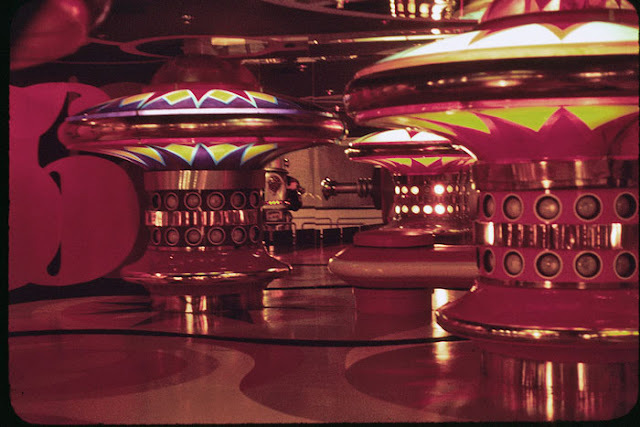 Looking like a psychedelic, Willy Wonkaesque playground, it was the world's first known indoor amusement park with multiple levels, attractions to explore, and characters straight out of the Kroftts' imagination. It sounds like a 70s child's dream. But only six months later, in November 1976, it was closed. How could something like this happen? An article printed in Old Chicago after the park went defunct which was posted on the site Theme Park Review reveals that the family attraction was plagued with problems from the get-go. The Kroffts borrowed virtually all of the money required to build the park--$10 million--on the condition that all profits would go towards paying off the loan. The park was due to open in February 1976, but a city-wide workmen's strike delayed it to May. Right up until opening weekend, construction was still going on and after the park was already in business, extra walls had to be added around two out of the three rides offered because the sunlight streaming into the Omni Center was ruining the effect. Did I mention that there were only three rides? Having an indoor location limited what the park could offer, so obviously sprawling rollers coasters were out, but the World did feature a Crystal Carousel with mythical creatures, a Living Island Dark ride (featuring a Krofft character, Witchie-Poo, as well as giant mushrooms and talking trees) and a Pin-Ball ride, where visitors were propelled through a giant pin ball machine. The World also employed entertainers including singers, mimes, jugglers, 18-foot tall clowns on stilts, sword swallowers and acrobats, and artisans selling their wares ("hippie stores", as one commenter on YouTube said his mother called them.) There was an Elton John show featuring a puppet that played his music. 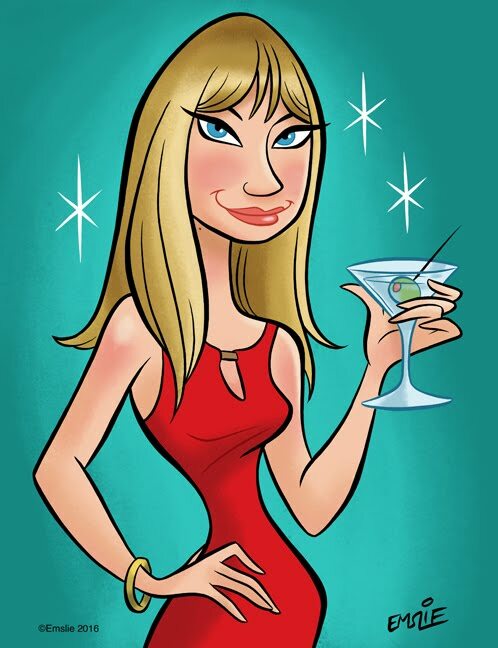 Animated characters could be found among the World, and there were theaters, food and games, as well as a gigantic ice skating rink. The World of Sid and Marty Krofft opened to much fanfare in May 1976. Jimmy Carter, Tony Orlando and Geraldo Rivera were among the A-listers who got invited along with the local media. The park was a cool concept, and a forerunner to Chuck E. Cheese, but it was competing with the nearby Six Flags Over Georgia, which offered a much larger, traditional outdoor amusement park experience for only a bit more money (and which featured a Sid and Marty Krofft puppet attraction.) The Kroffts' park was promoted as an all-day experience, but most patrons found that it only took a couple of hours to see and do everything within the floors and that the only direction one could go once in the park was down to the next level. The Omni Center was also constructed in what was at that time a rough part of Atlanta, surrounded by crime and housing projects. Parents felt it was simply too dangerous to take their kids there. Ultimately, the park just couldn't deliver enough bang for the buck and closed its doors in November 1976. 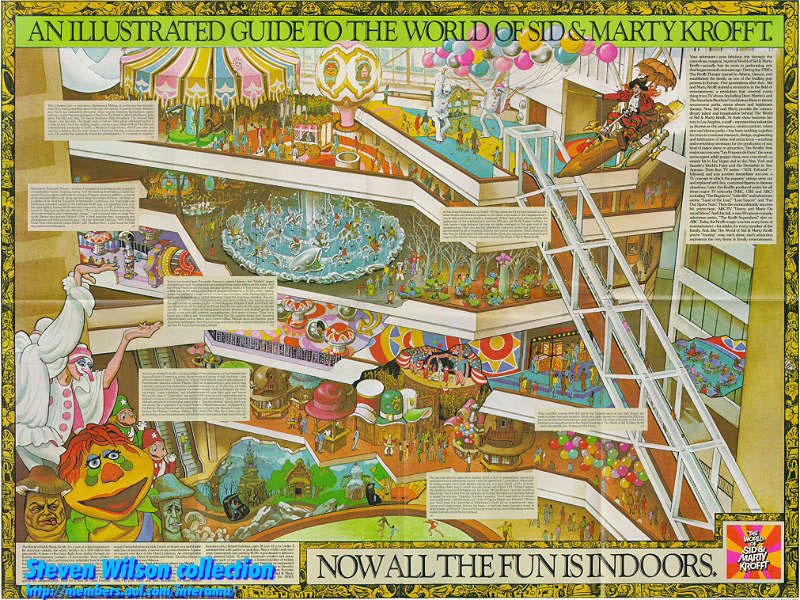 Today, the location of The World of Sid and Marty Krofft is now the CNN center, and all that remains of the amusement park is the massive escalator that used to carry visitors to the top floor. Don't you wish you could have visited it? Here's the Krofft brothers speaking in an interview about why they felt the concept didn't work -- mainly because the city of Atlanta promised to clean up the surrounding neighborhoods and make it safer for visitors but failed to deliver on its promise. It would've been cool to see this in action one time (and see Captain Kool & the Kongs in person) but geez I'm surprised it lasted as long as it did! Great stuff! This is by far the most informative article I've ever read on The World of Syd and Marty Krofft. A fail indeed, but I would have loved to have visited it. Doug--I know, I noticed Captain Kool in the video as well. I'm surprised that they said it only took a couple of hours to go through the whole park--from what I read and found, it sure seems like there were enough attractions for a whole day, counting watching a show or two and sitting down to have a meal. I love the concept; too bad it failed. Luis--thank you, glad you enjoyed it. I know, I wish I could have visited it as well. In the mid-70s I remember meeting some of the Sesame Street characters and being thrilled to meet Big Bird at a local mall, so something like this would have been my bag! Oh wow! I would have loved this when I was a kid! So ad that it didn't last! I think I'm one of the few people who actually went to the darned thing during the Summer of '76. I was 11 and my parents took me. I was crazy for Land of the Lost, and all the other Krofft shows. Oh, how high my expectations were. The park was a total effing bust. the Crystal Carousel was working, but nothing else was. I remember getting my face painted and hoping to see some of my favorite Krofft characters, but sadly, they weren't there either. The Pinball machine ride was so slow my grandmother could have out run the cars and then half way through the ride, it broke down, too and we had to kind of crawl our way back out to the main concourse. I remember a music show with a puppet Elton John that I guess was sort of ok. Basically the whole day sucked. Fortunately the day wasn't a total loss and we were able to have at least some fun as there was a huge ice rink on the main floor of the Omni. I must be one of the few people who actually went to this accursed park during the 4 months it was open. I was 11 in the summer of '76 and my parents took me. I was crazy for most of the Krofft shows, especially Land of the Lost. Oh how high my expectations were. The park was a total bust. The only ride working was the Crystal Carousel (Big Whoop) Both the living Island Ride and the Pinball Ride were "down for repairs" -- actually the Pinball ride worked at first but it was so slow and about midway through, it broke down and we had to kind of crawl out to the main concourse. Two things I do remember were getting my face painted with some sort of '70's psychedelic/RenFaire design, and watching a music show with a puppet Elton John on stage. Fortunately, the day wasn't a total loss as the Omni had a large ice rink on the main floor. That kind of salvaged the day, but basically the whole park sucked. Ted -- thanks for sharing. Even if the park sucked, how many folks can say they actually visited it? Pretty cool just the same. Too bad about the rides being under repair at the time you went. The bad thing about it was, you couldn't "revisit" an area or attraction. You had four tickets each for a different level and you had to go through a gate sort of thing at each level and give them your ticket. I remember the pinball level looking for all the world like the "Yellow Submarine" cartoon come to life. Any how, you couldn't go back up. Only down so if you missed something or wanted to ride one of the three rides again you were out of luck. OK, that makes sense. I was wondering why people weren't allowed to revisit a level--that's lame. I was in college when this opened/closed. What I do recall were the excellent radio ads. Selwyn Cirle (if I recall correctly) was someone who supposedly was a reporter on the World of Sid and Marty Croft. interviwer (overcom by how stupid Selwin was from the entire interview)): SELWIN! Selwyn: ...that's Syd and Sue's and Marty's and Selwin's World of Fluffy Stuff. Thanks You. (very pleased with himself). It is still as memorable now to me as the old Abbot and Costello's Who's on First. I wonder if any survived?